In March, the United States Special Operations Command, the section of the Defense Department supervising the US Special Forces, held a conference on the theme of “Sovereignty in the Information Age.” The conference brought together Special Forces officers with domestic police forces, including officials from the New York Police Department, and representatives from technology companies such as Microsoft. This meeting of top military, police and corporate representatives went unreported and unpublicized at the time. However, the Atlantic Council recently published a 21-page document summarizing the orientation of the proceedings. It is authored by John T. Watts, a former Australian Army officer and consultant to the US Department of Defense and Department of Homeland Security. The Atlantic Council, a think tank with close ties to the highest levels of the state, has been a key partner in the social media companies’ censorship of left-wing views. Most notably, Facebook acted on a tip from the Atlantic Council when it shut down the official event page for an anti-fascist demonstration in Washington on the anniversary of last year’s neo-Nazi riot in Charlottesville. Confident that none of the thousands of journalists in Washington will question, or even report, what he writes, Watts lays out, from the standpoint of the repressive apparatus of the state and the financial oligarchy it defends, why censorship is necessary. The central theme of the report is “sovereignty,” or the state’s ability to impose its will upon the population. 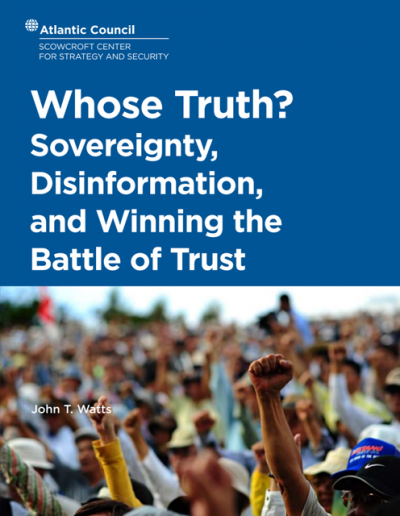 This “sovereignty,” Watts writes, faces “greater challenges now than it ever has in the past,” due to the confluence between growing political opposition to the state and the internet’s ability to quickly spread political dissent. Watts cites the precedent of the invention of the printing press, which helped overthrow the feudal world order. In the Atlantic Council’s estimation, however, this was an overwhelmingly negative development, ushering in “decades, and arguably centuries, of conflict and disruption” and undermining the “sovereignty” of absolutist states. The “invention of the internet is similarly creating conflict and disruption,” Watts writes. Watts notes that this collapse in support for the government cannot be explained merely by the rise of social media. This process began in the early 2000s, “at the dawn of the social media age but before it had become mainstream.” Left out are the major reasons for the collapse of popular support for government institutions: the stolen election of 2000, the Bush administration’s lies about weapons of mass destruction, unending war and the impact of the 2008 financial crisis. In other words, the rise of uncensored social media allowed small groups with ideas that correspond to those of the broader population to challenge the political narrative of vested interests on an equal footing, without the “professional gatekeepers” of the mainstream print and broadcast media, which publicizes only a pro-government narrative. People must be isolated, in other words, from the “incorrect” ideas of their friends and family, because such ideas are “difficult to correct” by the state once disseminated. Nor can the growth of political opposition, for the time being, simply be solved by “eliminating” (i.e., killing or jailing) political dissidents, because this only lends legitimacy to the ideas of the victims. But this is only the beginning. Online newspapers should “consider disabling commentary systems—the function of allowing the general public to leave comments beneath a particular media item,” while social media companies should “use a grading system akin to that used to rate the cleanliness of restaurants” to rate their users’ political statements. “governments need to create consequences” for spreading “disinformation” similar to those meted out for “state espionage” – which can carry the death penalty. What Watts outlines in his document is a vision of a totalitarian social order, where the government, the media, and technology companies are united in suppressing oppositional viewpoints. The most striking element of the document, however, is that it is not describing the future, but contemporary reality. Everything is in the present tense. The machinery of mass censorship has already been built. The Atlantic Council report, based on high-level discussions within the military and state, is a confirmation of everything the World Socialist Web Site has said about the purpose of changes in the algorithms of internet and social media companies over the past year-and-a-half. Over the subsequent year, key details of the open letter have been indisputably confirmed. At congressional hearings and in other public statements, leading US technology companies have explained that they reduced the propagation of political views and statements targeted by US intelligence agencies, and did so in secret because they feared a public outcry. At the same time, they have explained the technical means by which they promoted pro-government, pro-war news outlets, such as the New York Timesand Washington Post. But the Atlantic Council document presents the most clear, direct and unvarnished explanation of the regime of state censorship. The struggle against censorship is the spearhead of the defense of all democratic rights. The most urgent task is to unify the working class, which is engaged in a wave of social struggles all over the world, behind the struggle against censorship as a component of the fight for socialism.